“You mean to say the basis of a good life is selfishness? Then, why are we taught right from childhood, that selfishness is a vice not a virtue?” questioned a baffled Mukta. The novel, set in a town in western Uttar Pradesh, spans half a century, as the plot alternates between the pre-Independence years (1934-42) and the last quarter of 1989, thus straddling two generations of the Sinha family. The narrative parallels the times of the father and the son, moving back and forth in time. In Prof Samrendra Sinha’s story, the Red Mansion is a hub of political, social and familial bustle, while in his son Samar’s life it is the centre of intrigue. The two time-frames, linked by the same locale – the family house – also correspond with the change in environmental tone of the period. While the pre-Independence scenario is high on idealism, social affinities, the moral fibre, the alternate setting sceptically questions the same very value system and debates a dilemma of sorts. 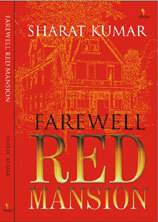 Farewell Red Mansion is English translation of the Hindi original, Lal Kothi Alvida. A television serial of eighty-two episodes based on this novel was telecast at prime time on the national channel of Doordarshan. Subsequently, a full-length feature film, Duvidha, was also produced. It has received Mention Spéciale du Jury at Strasbourg International Film Festival, France, 2009.